NetCrunch automatically shows pages according to the selected Atlas View's content. 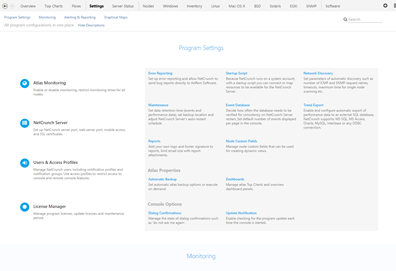 Instead of staying on the same page like previously, the program selects the best page to display the most relevant content. The user can override these settings and select which page will be visible as the default page for the chosen view. If you click holding ctrl button the page switch will be locked. All settings are searchable and you can find them on a single Settings page at the Atlas top level view. Now you can create multiple profiles for each system. Previously, only the default profile was available. Physical segment maps now show live network traffic in both directions. A new dashboard designed for monitoring smaller networks displays the details of each node's status for views containing up to 50 devices. The search feature now has new options and looks for: nodes, atlas views, program settings, documentation topics, knowledge base articles and blog posts. Atlas Rescan - added the ability to re-scan the whole atlas when you add new SNMP profiles or services. Now NetCrunch can re-scan all nodes, networks and domains in a similar way to initial scanning. It allows you to send data to NetCrunch nodes using REST API. It also supports sending status values so that a user can easily track and react to these statuses. For example: by sending the status of door=open we can visualize it and react on its change or value. Feeding NetCrunch with data has never been easier! Now every Active Directory domain can be automatically re-scanned in order to discover new nodes that should be added. User accounts and access profiles have been redesigned. Now Console and WebAccess use the same accounts for authentication. 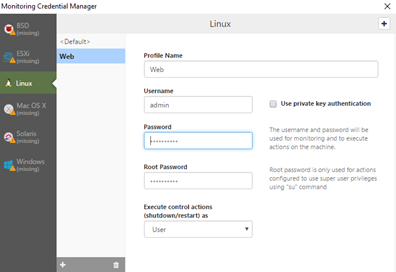 New User & Access Rights Manager window is much easier to use than the previous one. Additionally, various settings are now automatically synchronized within the user profile and between desktop console and web console. New "NetCrunch Audit" Monitoring Pack enables tracking users access to NetCrunch Console and failed login attempts to the Console. New window offers better insight into event parameters and implements many useful features which give you more flexibility to fine tune the alert settings. NetCrunch trend viewer has been improved in order to better present various metrics collected by the program. More chart display types (trend, trend + range, stacked, area) - range charts automatically display min, max and average data. Program includes new SSH remote monitoring engine and Monitoring Pack for Solaris system, including monitoring over 30 disk related metrics. New window delivers better note management. Each note can be easily commented by NetCrunch users and can have labels and due date. Notes can't be deleted but you can archive them with single click. Bar chart has been improved and uses the same color schemes like other chart types. Additionally, small triangle next to the value shows the latest change direction. Charts support SNMP tick unit conversion to standard time units (seconds, milliseconds). All charts perform animations for better change indication. New window allows easier reviewing and fixing all issue categories. You can select all nodes affected by the issue and fix it with one click. 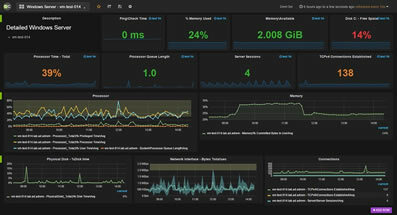 New GrafCrunch version is based on stable version of Grafana 2.6. The most important feature for NetCrunch users is that you can now connect to multiple NetCrunch servers and create summary dashboards on a single screen. 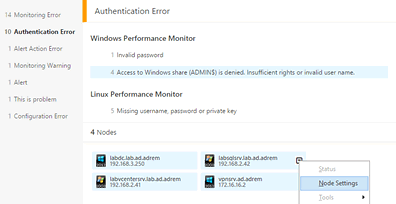 Managing monitoring credentials has been moved to separate window and is much easier now. NetCrunch offers integration for several external service desk and messaging services. It means that when NetCrunch opens an external ticket, it can also automatically close this ticket when the alert is closed. Two way integration also allows for alert to be automatically closed in NetCrunch after the ticket had been closed in the external system. Current version supports the most popular services, but more integration will be added in the future versions. NetCrunch supports using additional field (context) for SNMPv3 monitoring. It allows monitoring layer 2 segments on Cisco switches using SNMPv3. New versions extends disk monitoring capabilities for each Unix family system. This is based on iostats tool features available on particular system. After configuring sensor you can test its configuration by using new Test button. NetCrunch 9.2 adds another tab in the external events window. Messages can be send using REST API using HTTP protocol from any application. After receiving it you can create an alert for such external message. It works in very similar way to syslog messages and SNMP traps. Now you can switch off auto popup feature and only observe blue dot with number of tasks that require you attention. Now you can create view for nodes having IP address assigned or not assigned. Node properties are accessible in WebAccess in read-only mode. When no maps are available for the user (due to access rights settings) , the Atlas Tree is automatically collapsed. You can rename and add new folders in Alerting & Reporting Settings window. Trigger alerts based on an email sender, subject or body. The sensor can match emails using simple text patterns or regular expressions. This sensors allows you to monitor of mailbox authentication, activity, performance and size. You can check if the mailbox is properly processed by checking the oldest email in the mailbox or when the last message has been received. This sensor parses files and converts each entry into a list of properties which later can be filtered like any other type of logs (window event log, syslog). This gives you more control over how alerts are triggered and also allows for better analyzing of the collected log entries in the event log. Trigger alert on monitoring issues. For example when authentication fails. You can specify code page encoding for Syslog and SNMP traps. New actions that give you more control over monitoring and Atlas Views. You can change or clear the node custom field. Because you can use custom fields to create dynamic views, this feature can help you create views that are controlled by NetCrunch alerts. You can control node monitoring time when an alert occurs. 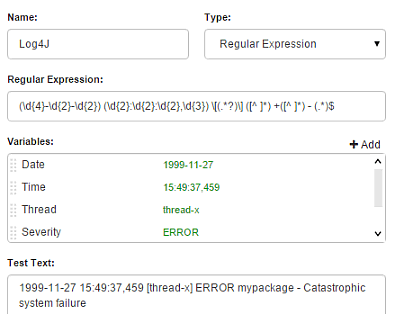 NetCrunch 9.1 introduces parsing expressions which allows you to describe how to parse external text data. You can use regular expressions and other patterns. Parsing expressions allows you to parse a given text (line of the log or file) and outputs a list of key-value pairs. You can define the format of each line which is converted to a list of properties (key-value pairs), which can then be easily filtered, stored and alerted on specific parameters. This turns text logs into regular logs with fields that can be later processed. NetCrunch can trigger alerts on emails received. To simplify processing alerts you can parse emails and store all data as event parameters. Now you can create dynamic views on pending alerts and relative time expressions. This allows to create views containing node with certain pending issues. Time expression can be used to manage expiration or maintenance dates. For instance, you can set date of maintenance and create view of nodes that needs maintenance in less than week. We added new views to the event log that allow you to see resolved issues within a selected time range. For example, you can quickly find all issues resolved after more than 1 hour in the last 24hrs. On the other hand, you can find out which alerts have been solved in less than 10 minutes, which may indicate settings that are too sensitive. The new editor is much easier to use and allows you to create custom formats. It also allows for customizing messages sent on alert close. Now you can add multiple sensors with the same url but different ports when you run multiple HTTP servers on a single node. Now you can set alerts on ESX datastore metrics. The datastore view is also available in the Node Status window. You can schedule restart of NetCrunch service weekly at given time. You can also see when next restart is planned. The NetCrunch Server is now a 64-bit application built for high performance and memory scalability. The MIB Compiler was one of the server components that couldn't be accessed from the remote console. As a 64-bit program, the NetCrunch Server installs in the "Program Files" folder now. Program data paths no longer contain version numbers and NetCrunch will use the same data folder in future versions. All Incoming traps and syslog message (even from nodes not being monitored in Atlas) are visible in the External Events window. With a single click, users can convert them into alerts (the node will be added to Atlas if necessary). 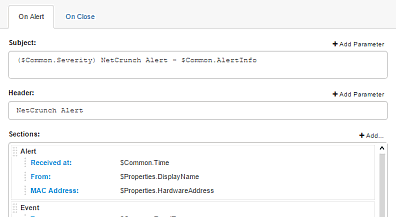 In this way, NetCrunch allows you to define alerts for traps "by example". The simplest condition is to trigger an alert when an alerting condition is met. But what about something that did not happen? Like a scheduled backup? Among the alerting possibilities of NetCrunch, you can define an alert for when a specific event did not happen in a certain time range or after specified time (backup not completed or heartbeat not received). Other conditions allow you to suppress alert execution for some time. For example, power loss should trigger an alert after several minutes. If power is restored within a given time, no action should be executed. Advanced correlation allows also you to trigger events only if multiple events have happened within a given time range, or are pending at the same time. For example, this allows you to define an alert when two redundant interfaces are down. NetCrunch allows you to monitor Cisco IP SLA operations. It tracks the status of operations and also performance parameters. This allows you to monitor VOIP jitter and other protocols. The Node Status Window can display the status of all operations defined on devices. Time Range schema is used in many places like: monitoring time restrictions, alert time restriction, conditional alerts and others. 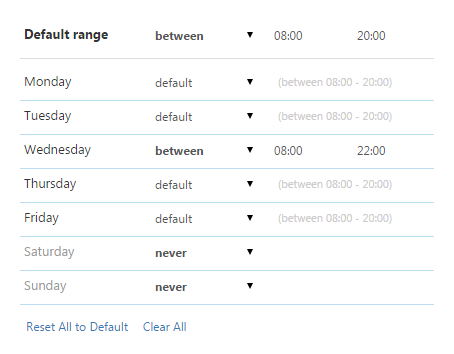 Now, you can define complex schema for each weekday. Each action can be limited to run only if a triggering network node belongs to a given atlas view (these can be created by rules or manually) or within a given time range. This allows you to create flexible alerting scripts, for instance sending different notifications depending on the node location. GrafCrunch is a fork of the open source performance visualization project Grafana. It increases the possibilities of creating live performance dashboards and allows you to present data from various sources. The installer automatically handles connecting it to the NetCrunch Server. 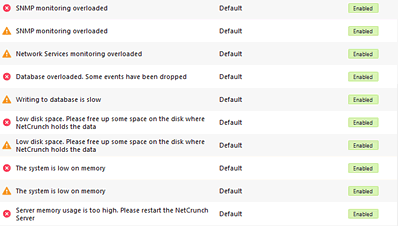 NetCrunch now has its own monitor which tracks various NetCrunch Server parameters and triggers notifications to administrators if any problems occur. Program will alert you on overloaded components, when a new version is available, or if your maintenance subscription is about to end. This pops up when some task is executed by the NetCrunch Server and might need administrator attention. For example, the node auto discovery process might put a notification here and wait for your decision about which nodes should be added. Node monitoring settings are a complex yet powerful tool, so when you forget where to go, NetCrunch can guide you interactively. You can now add your logo to report footers. The list makes it clear when a notification has been sent, an alert is being closed, or a reminder has been sent after some time since an alert occurred. Favorite Atlas views has been moved from the bottom of the Atlas Tree window to the top popup menu. Receiving and setting SNMP trap has been simplified. Currently you can receive traps even if the node has no SNMP monitoring enabled. SNMPv3 requires only defining global authentication profiles. No individual node setting is required. NetCrunch receives all traps by default, even from nodes not monitored in the Atlas. These traps are visible in the External Events window and you can turn received traps into an alert with a single click. Also you can define custom services using SSL connection. Additionally PING checking method has been changed to use system software for more accurate measurement.